The 2009 Corvette ZR1, GM's new mega-powered super car, will reportedly only be offered to the top 338 Chevy dealers nationwide. That effectively shuts out the other 3,594 from the chance of offering one to enthusiastic fans of the bowtied brand. We guess that explains the four-times-the-price gouging we're hearing about from potential customers. That's right, although the 638 HP 2009 ZR1 gets a price tag of $103,300 ($105,000 with the $1,700 gas guzzler tax) and Corvette engineers asking dealers to respect the MSRP, we've received at least one report from a reader of being told that despite his down payment 2 1/2 years ago, he'd have to put up between two and four times the MSRP to get one in his garage. If that number is accurate, the street price will be somewhere between $206,600 and $413,200 for Zee Really fast One. Full report from our tipster looking for recourse from someone — anyone — after the jump. "I put a deposit down for the 2009 ZR1 about 2 1/2 years ago at "my" chevy dealer from whom I have bought many GM cars, including trucks, vettes. I have probably bought 15+ GM vehicles over the years. I was told 2 1/2 years ago that the price for this "iffy" car would be around the same ratio as the 5K overcharge I paid for my 2006 Z06. 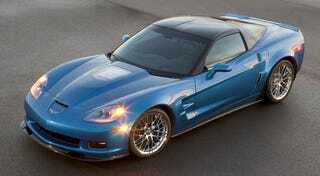 I was called to order my ZR1 yesterday since I was #1 on the allocation list of this dealer's 4 allocations. I was told that by the way the price would be between 2-4 times the MSRP. Tadge Juechter, the Chief of Corvette Engineering, has urged GM ZR1 dealers to respect the MSRP. I am very upset with the greed and disregard for customer loyalty in a down economy. Is there any recourse?"